WASHINGTON / NANGARHAR, AFGHANISTAN — Since the beginning of 2018, Afghanistan’s eastern Nangarhar province has experienced more than 70 terror attacks, killing 260 and injuring over 500, according to an Afghan watchdog organization that monitors violence and civilian casualties around the country. A large number of those killings have been the result of suicide bombings. In a report sent to VOA, the Civilian Protection and Advocacy Group (CPAG) said the province — birthplace of Islamic State’s Afghanistan branch — estimates more than 700 civilians and have been killed or injured. CPAG’s data cover terror attacks during a six-month period from January to July 2018. According to CPAG, during the same period, 52 civilians have been killed and 33 others wounded by Afghan security forces during their operations against militants in the province. Some of the operations have been conducted jointly by Afghan and U.S.-led coalition forces. Afghan officials say their operations in the province have been cautiously planned and executed to avoid civilian casualties. Earlier this month, an Afghan army soldier tried to thwart an IS suicide attacker in the province by throwing himself at the bomber just before the attacker triggered a blast. The soldier, Mohammad Omar, was killed, along with three other people. IS is not the only group active in the province. Taliban insurgents have also staged attacks in recent months. Besides targeting Afghan security forces, both groups have engaged in fierce fighting among themselves over control of territory in the province. In a wave of violence last week, IS claimed responsibility for a suicide attack near an election office in the capital, Jalalabad, where two civilians were killed and four were injured. Provincial security officials charge that IS is desperately trying to portray itself as a potent group. “Islamic State has suffered heavy losses in the province, especially in Pacher Wa Agam and Deh Bala districts. That is why IS has doubled its efforts and has carried out more attacks, fearing a total wipeout,” General Ghulam Sanaie Stanikzai, Nangarhar’s police chief, told VOA. Deh Bala district was IS’s stronghold in Nangarhar before the U.S. and Afghan Special Forces captured it in July. Josh Thiel, a U.S. Special Forces battalion commander, told VOA last month that they had cleared Deh Bala of IS. This year’s deadliest terror attacks occurred June 16 and 17 during the Eid holidays when people celebrated the first historic cease-fire in the province. IS suicide bombers killed 46 and injured another 130 people, mostly civilians. The violence in Nangarhar prompted Afghan President Ashraf Ghani to deploy the army to the province to maintain security and prevent further attacks. The move was criticized by some who alleged the presence of armed forces resulted in more terror attacks. 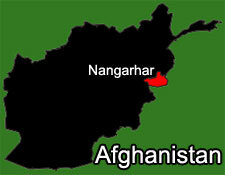 “Do not turn Nangarhar into a prison. The Afghan government needs to control the ongoing unrest with its intelligence force, not the army, and shift its fighting strategies and policies,” Aziz Ahmad Tasal of CPAG said in a press conference earlier this month. Army troops were eventually replaced with elite police units. U.S and Afghan forces have kept IS under constant pressure since the group first emerged in Afghanistan in 2015. On Sunday, Afghan officials confirmed that Abu Saad Erhabi, head of IS in Afghanistan, was killed in a U.S airstrike in Nangarhar province. Erhabi was the fourth leader of IS-Khurasan killed since 2015. His predecessor was Abdul Haseeb, who was killed in 2017 during a joint U.S.-Afghan operation. A spokesperson for Ghani told VOA that the killing of IS leaders demonstrated the government’s resolve. “The killing of IS leaders and the severe crackdown against Daesh displays the [Afghan] government’s determination in its fight against terrorism,” Shah Hussain Murtazawi said, using the Arabic acronym for IS. Some analysts charge that the rise in violence in Nangarhar could be the result of growing pressure on IS. “As ISIS begins to feel besieged by a variety of actors — not just the Afghan and U.S. militaries but also by the Taliban — it wants to step up its violence and attacks to make it clear that it’s still potent,” Michael Kugelman, an analyst at the U.S.-based Wilson Center, said. Others point to strongmen and warlords in the province who have paved the way for militant groups. “Local strongmen and warlords have grown wealthy and benefited from the war. They had no wealth before, but now they own buildings and cars. Therefore, they do not want Nangarhar to be peaceful,” retired Army Colonel Mohammad Anwar Sultani said. Afghan officials, however, charge that because Nangarhar shares a border with Pakistan, militants easily cross the border into Afghanistan to carry out terror attacks. “We have a total of 225 kilometers [140 miles] of open border with Pakistan, and have several crossing points in the province which could also be utilized by enemies to cross into Afghanistan,” said Stanikzai, the Nangarhar police chief. Some analysts believe that the smuggling of minerals, drugs and timber have also contributed to insecurity. “The districts of Nangarhar province have nephrite, marbles, fluorite and slate mines. And instability and insecurity enable the Mafia to extract these mines and empower themselves,” Mohammad Jawad Rahimi, a U.S.-based Afghanistan expert, told VOA.